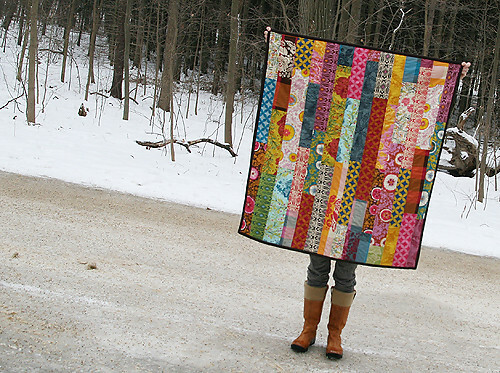 It's amazing what you can make with scraps, isn't it? I received a fat quarter set of Anna Maria Horner's Good Folks line for my birthday. Two birthday's ago. And although I still haven't made the quilt I originally planned with the fabric, I have cut out the pieces. And I had a lot of scraps left over. 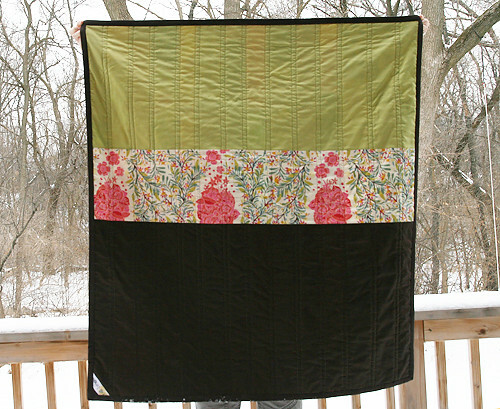 I really, really, really love this fabric and there was no way I was going to let the scraps go to waste. Back to the quilt though! I pieced together all my left over strips. This small quilt measures 39" x 43". I quilted straight lines vertically down it, 1/4" on each side of the seams. It has a bit of loft to it and just looks so soft. The back is a wider piece of fabric from the same line, with Kona artichoke on top and Kona espresso on the bottom. The binding is also Kona espresso. Even though the color always photographs looking black, I just love the deep brown in real life and find myself using it often. 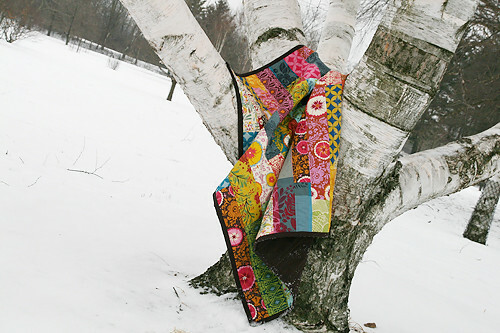 Next I am going to be finishing up an Echino quilt I started last summer. The blocks are finished and I plan on sewing the top together today! 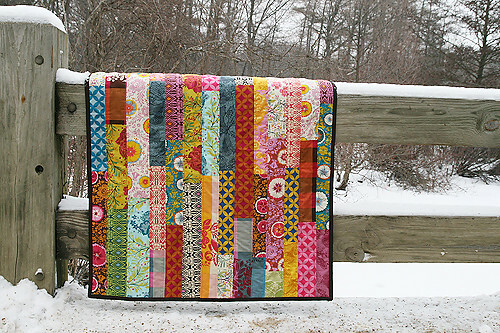 ETA: Interested in this quilt? It will be auctioned off by the Katy Kidney Beans sometime in March to raise money for the National Kidney Foundation. I will post a blog post with the details when I know more.